Zion National Park, famous for its beautifully sculptured rock formations and immense canyons, is a remarkable hiking vacation destination for visitor's of all ages. Zion Park’s 229 square miles of formations provides endless opportunities for exploring diverse natural terrain, and is a favorite for hikers throughout the world. 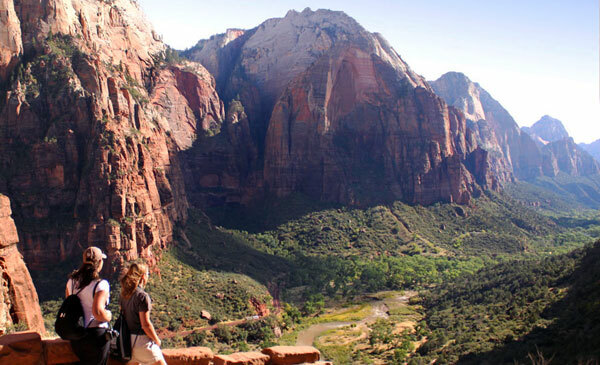 While staying at Zion Ponderosa Ranch Resort you may choose to take a short nature walk to observe Zion National Park’s unique ecosystem, or climb to the top of Angel’s Landing, one of the most prominent and thrilling hikes in Zion Park. Either way you are sure to conclude that there is nothing else like hiking in the canyons of Zion where there are scores of hiking trails to choose from. Zion is known for its deep slot canyons and has become very popular for canyoneering, a term that was likely invented in this region. Canyoneering is defined as the exploration of narrow canyons. Visit our main Zion Ponderosa site - here. One of Zion’s slot canyons, the Zion Narrows, attracts hikers from all around the world and The Narrows was ranked number five on National Geographic’s 100 Best Adventures. If you're thinking of trying out canyoneering in Zion, be ready to swim in cold water, traverse slick rock, and learn the technical skill of rappelling. You should never enter a canyon without the knowledge and skills needed to safely explore and return. If you want to try canyoneering but are not experienced, sign up for a guided canyoneering adventure at Zion Ponderosa; it is sure to be a hiking tour you'll never forget. View a hiking video here. Zion Ponderosa is a 4,000 acre ranch located on the east rim of the park and is the perfect location for your next Zion hiking trip. We provide lodging, dining and a wide selection of adventures and recreational activities, all for a great price. If you are planning to experience hiking trails in Zion National Park, Zion Ponderosa Resort is the perfect base camp for your adventure. We provide shuttle services to many of Zion’s most popular trailheads, as well as guided hikes through some of Zion’s less explored slot canyons. 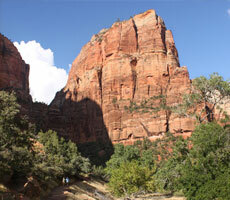 There's just no question that a Zion National Park hiking trip with Zion Ponderosa is the right choice.